This post is going to be short, but should entice you to stay tuned. Craig Halloran and I connected recently thanks to an introduction from Brian Rathbone. Craig generously provided me with copies of his series, The Chronicles of Dragon. I've already finished the first book of seven (books 8-10 coming soon). I'm steadily on pace to finish the rest of the series in the next couple weeks, but I'm a little afraid the beautiful weather has been distracting me from writing. 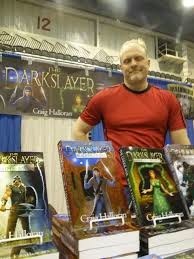 So, this is an advanced thank you to Craig and heads up to anyone who reads this blog: I will be reviewing all seven of Craig's books, doing a give away, and an author interview very soon.